With the iPad 2 officially launching yesterday, consumers are getting their hands wet with Apple’s latest gadget. Unfortunately, early reports indicate that some iPad 2 users are experiencing troubling issues with the iPad 2’s display. The problems seem to mainly deal with yellowish spots and light “bleeding” from around the bezel onto the display. The first problem appears to be similar to an issue that plagued the iPhone 4 upon its release last year. iPad 2 users on macrumors.net are reporting a yellowish tint on certain areas of their tablet’s screen. The yellowish spots are very similar to the spots that were found on some iPhone 4s and caused a bit of a stir. Thankfully, the iPhone’s problem was only due to a bonding agent (Organofunctional Silane Z-6011) that hadn’t cured properly due to the quick production and shipping timetables of the iPhone. As a result, the agent evaporated in a couple days and the spots disappeared along with it. Subsequently, iPad 2 users are hoping that the problem is the same and nothing more serious. As far as the second problem goes, users are reporting a “bleed” coming from the edges of the iPad 2’s IPS display. 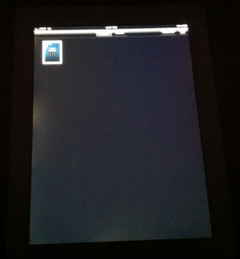 The light leakage is quite noticeable against dark backgrounds and seems to affect White and Black iPad’s equally. Multiple threads have popped up on the Apple support forums describing the issue and an Engadget poll showed a good number of afflicted users. Unfortunately, the leakage doesn’t appear to be confined to one edge of the screen and as of now the only workaround seems to be adjusting the iPad 2’s brightness controls. With an issue like this, the solution might require a recall or repair of the tablet by Apple. Although Apple has usually been known for above-average build quality, early problems with the iPad 2 don’t appear to reflect that. With dozens of reports of light leakage and yellowish spots, Apple’s overall sales numbers could possibly take a hit. While the yellow spots could resolve themselves in a couple of days, we’re going to have to wait for an official Apple response about the light bleeding and what steps will be taken to remedy it.